Since 1994, A-Pro has been helping its clients make smarter, better and more informed decisions as they buy or sell a home. 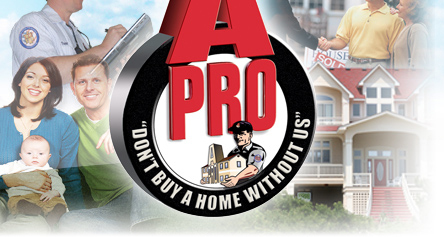 As one of the leading home inspection service companies in the world, A-Pro not only offers you the best possible home inspection, service, and value, but also provides you with the peace of mind that your investment is guaranteed. Do you have a solid foundation? Read our Foundation Level Survey. Is your home Energy Star Qualified? This entry was posted on Thursday, August 5th, 2010 at 7:39 pm	and is filed under Home Inspection Resources, More Information. You can follow any responses to this entry through the RSS 2.0 feed. Both comments and pings are currently closed.